Bottle Buyers Club Membership - Perelandra Ltd.
Payment of $80.00 charged yearly for 10 payments. Membership benefits have changed as of January 2019. A Bottle Buyers Club membership gives you your very own personal, year-round sale. Do you . . .
Order Perelandra Solutions and Essences four or more times each year? Take MBP Solutions or other Perelandra Solutions daily? Use ETS or Essence of Perelandra (EoP) every day? Often give your last bottle of ETS to someone in need? Work with PIC List testing? Do daily Essence testing or find yourself testing all of your family and friends? Use Essences Telegraph Testing for serious illness? Work with the Microbial Balancing Program? Support your goals and projects with ETS for SLGs, ETS for Soil and EoP? If you do any of the above, the Perelandra Bottle Buyers Club is the best way for you to save on your bottles and shipping with every order. By becoming a club member, you can always save on the Solutions or Essences you need, when you need them. This makes it easier to keep up with your regular doses, giving you better results. We've done the math and found that the Bottle Buyers Club offers the best savings to folks who order four or more times in a year. And when we do have specials and sales, we often offer something extra to those in the Bottle Buyers Club. Individual bottles are available in 1/2-oz. and 2-oz. dropper bottles, and 8-oz. refill bottles. Not all products come in all sizes. For example, individual Perelandra Essences are only sold in 1/2-oz. dropper bottles. However, ETS for Humans, Essence of Perelandra (EoP) and a few other Solutions are available in all three sizes. Available sizes are noted on the product pages linked above. After your order is submitted, add a note to the order telling us the free bottle(s) you would like included. You'll find the "note" box at the bottom of your order confirmation. You get 1 free bottle in that size for every 5 bottles of the same size in one order. Important: Do not include your free 6th bottle with the order. Doing so will charge you regular price for that bottle. For example, if you buy ten Perelandra Essences in 1/2-oz., you could request a free 1/2-oz. MBP Immune Solution and a free 1/2-oz. ETS for Soil. If you buy fifteen 2-oz. bottles that are a combination of any MBP Solutions, ETS and EoP, you could request any three Perelandra Solutions in 2-oz. bottles be included free. And so on . . . There is no limit to the number of bottles you may purchase and the number of free bottles you may claim in a single order. However, only individual bottles at regular price will count toward your free bottle(s), and the free bottles are calculated per single order. Any bottled products that are part of a discounted combination or set are not eligible to be counted toward free club bottles. As a club member, you'll save on shipping whenever you purchase bottled products. Whether you order 2 or 20 bottles, you get your special club shipping rate. Club members in the U.S. will be entitled to free shipping. The shipping method for each order is chosen by us among three options: FedEx, UPS or US Mail. Packages may take up to 2 weeks (weather permitting) in transit, depending on weight and destination. The only time a Club member will pay regular price for shipping is 1) when placing an order that does not include any bottled products or 2) if you're in the U.S. and you select a faster shipping method like FedEx Next Day. When you initially sign up for the Bottle Buyers Club, we'll send a free welcome gift worth over $25! With your first shipped club order, you get a 1/2-oz. bottle of Essence of Perelandra (EoP), a printed copy of the PIC Brochure and a Perelandra Zip Bag. Once you become a member, you may begin requesting your free bottles with your next order. When you sign in to your Perelandra account and place your order, U.S. customers will see the 'Bottle Buyers Club: Free U.S. Shipping' option when you checkout and international customers will need to enter a special coupon code "BBC15" for your $15 shipping discount. And after your order is submitted, you will add a note to the order telling us the free bottles you would like included. When you click on the "Add to Basket" button at the top of this page, a "Terms of Membership" page will appear. After reading the terms of the Bottle Buyers Club Membership, you will need to click "Accept" to continue. Once you accept the terms of the club membership, you may continue shopping or click the Checkout button to complete your order. After your order is submitted, you'll receive an email confirmation welcoming you to the club. Your free Welcome Gift will be sent with your next shipped order. We'll send reminder emails prior to your membership renewal date. If your credit card hasn't changed or expired you won't need to do anything. Your subscription will renew automatically, and you will receive an email to let you know you're part of the Bottle Buyers club for another year! If you decide you do not want to continue the membership you can cancel at any time, but the membership fee is non-refundable. There is no partial refund available for the club membership. Your benefits will continue until your paid year expires. • You can read the complete "Terms of Membership" by clicking the "More Details" tab at the top of this box. • Your membership will be activated on the next business day after purchase. If you order bottles that qualify for the discount along with your membership or while the membership is being processed, add a note telling us the free bottle(s) you would like sent along with that first order. • The membership gift is not given with renewals. This includes if you let your membership expire, and then sign back up for the club a month or six months later. • The purchase price of the membership does not qualify for the Chronologically Gifted (aka "senior") discount. • If you have any questions about the club or email notices related to your membership, please contact us. These Terms are between you and Perelandra, Ltd. and govern our respective rights and obligations. If you sign up for a Perelandra Bottle Buyers Club (PBBC) membership, you accept these terms, conditions, limitations and requirements. You may cancel your Bottle Buyers Club membership any time by visiting "My Account > Subscriptions" and clicking the "Cancel" button. If you cancel within 3 business days of signing up for a paid membership, we will refund your membership fee; provided that we may charge you (or withhold from your refund) the value of PBBC benefits received by you and your account during this 3-business day period. If you cancel at any other time, the membership fee is non-refundable. Bottle Buyers Club benefits are limited to certain products sold by Perelandra, Ltd. Eligible products will be designated as such on their product pages. Some special shipping, handling fees, and/or taxes may still apply to eligible purchases. If only some items in your order are eligible for the Bottle Buyers benefits, you may pay applicable shipping charges for the ineligible items. Changing or combining orders, or changing your shipping address, speed or shipper preferences might affect your shipping benefits. Qualifying U.S. orders receiving the free shipping benefit will ship via our choice of FedEx, UPS or US Mail. Packages may take up to 10 business days (about 2 weeks) in transit, depending on weight and destination. International Bottle Buyers Club members will redeem their shipping discount by using a special coupon code "BBC15" at checkout. The Bottle Buyers Club order page, provides information about eligible products. We reserve the right to accept or refuse membership at our discretion. From time to time, Perelandra, Ltd. may choose in its sole discretion to change, add or remove PBBC membership benefits. 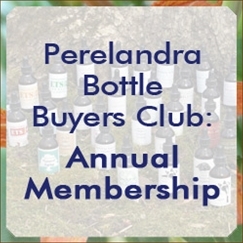 We may contact you by email, phone or letter with information related to the Perelandra Bottle Buyers Club and your membership, regardless of any preferences related to your Perelandra account. You may not transfer or assign your membership or any benefits, including coupon or discount codes. This membership is retail only. Bottle Buyers Club members are not permitted to purchase products for the purpose of resale, or to ship to their customers using PBBC benefits. The membership fee for the Bottle Buyers Club is stated on the Bottle Buyers Club order page. From time to time, we may offer different membership terms, and the fees for such membership may vary. The Perelandra Bottle Buyers Club membership fee is non-refundable except as expressly set forth in these Terms. Taxes may apply on either or all of the membership fee, bottled products or reduced shipping charges. Only credit cards may be used for payment of your PBBC membership. Do not sign up for the Bottle Buyers Club with a debit card. Also known as a "check" or "ATM" card, a debit card typically has the word "debit" printed on the face of the card. UNLESS YOU NOTIFY US BEFORE A CHARGE THAT YOU WANT TO CANCEL OR DO NOT WANT TO AUTO RENEW, YOU UNDERSTAND YOUR PERELANDRA BOTTLE BUYERS CLUB MEMBERSHIP WILL AUTOMATICALLY CONTINUE AND YOU AUTHORIZE US (WITHOUT NOTICE TO YOU, UNLESS REQUIRED BY APPLICABLE LAW) TO COLLECT THE THEN-APPLICABLE MEMBERSHIP FEE AND ANY TAXES, USING ANY CREDIT CARD WE HAVE ON RECORD FOR YOU. We may terminate your PBBC membership at our discretion without notice. If we do so, we will give you a pro-rated refund based on the number of full months remaining in your membership. However, we will not give any refund for termination related to conduct that we determine, in our discretion, violates these Terms or any applicable law, involves fraud or misuse of the PBBC membership, or is harmful to our interests or another user. Our failure to insist upon or enforce your strict compliance with these Terms will not constitute a waiver of any of our rights.